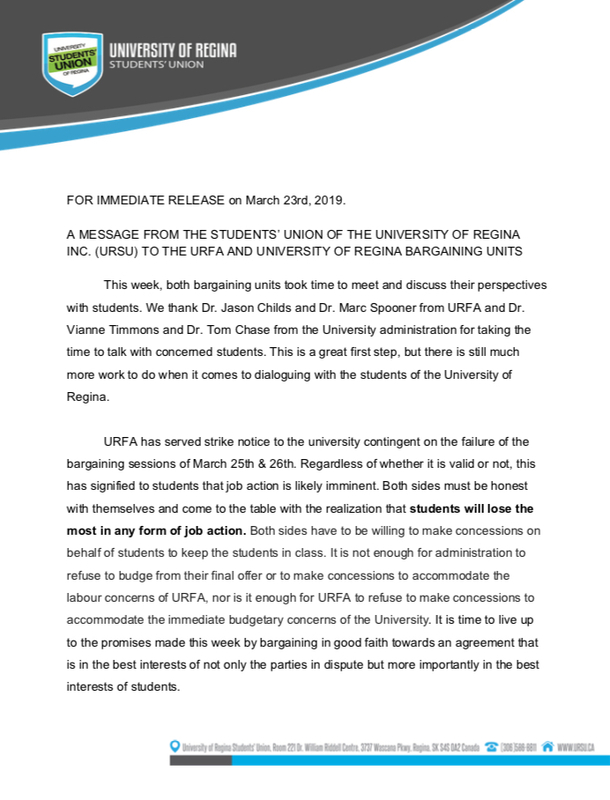 The following letter was sent by the University of Regina Students’ Union to the bargaining units of the University of Regina Faculty Association (URFA) and the University of Regina Administration. FOR IMMEDIATE RELEASE on March 23rd, 2019. This week, both bargaining units took time to meet and discuss their perspectives with students. We thank Dr. Jason Childs and Dr. Marc Spooner from URFA and Dr. Vianne Timmons and Dr. Tom Chase from the University administration for taking the time to talk with concerned students. This is a great first step, but there is still much more work to do when it comes to dialoguing with the students of the University of Regina. URFA has served strike notice to the university contingent on the failure of the bargaining sessions of March 25th & 26th. Regardless of whether it is valid or not, this has signified to students that job action is likely imminent. Both sides must be honest with themselves and come to the table with the realization that students will lose the most in any form of job action. Both sides have to be willing to make concessions on behalf of students to keep the students in class. It is not enough for administration to refuse to budge from their final offer or to make concessions to accommodate the labour concerns of URFA, nor is it enough for URFA to refuse to make concessions to accommodate the immediate budgetary concerns of the University. It is time to live up to the promises made this week by bargaining in good faith towards an agreement that is in the best interests of not only the parties in dispute but more importantly in the best interests of students. We want to highlight some of the concerns we have heard over the past week that each party must consider in their negotiations. There are 131 international students with expiring leases, flights home booked, and study visas set to expire. Many students who are set to graduate have accepted jobs that are contingent upon completion of a degree by May 1st. Students have leases or housing contracts expiring May 1st. Students have accepted jobs starting immediately after final exams that they cannot defer training for or starting. Students cannot afford to extend their semester and purchase food and other basic necessities. Many students will be receiving their final student loans at the beginning of April and will be without assistance if the semester is extended. A strike is neither necessary or helpful to the student body. We once again call upon both bargaining units to put in the hard work and bargain in good faith to a resolution immediately. 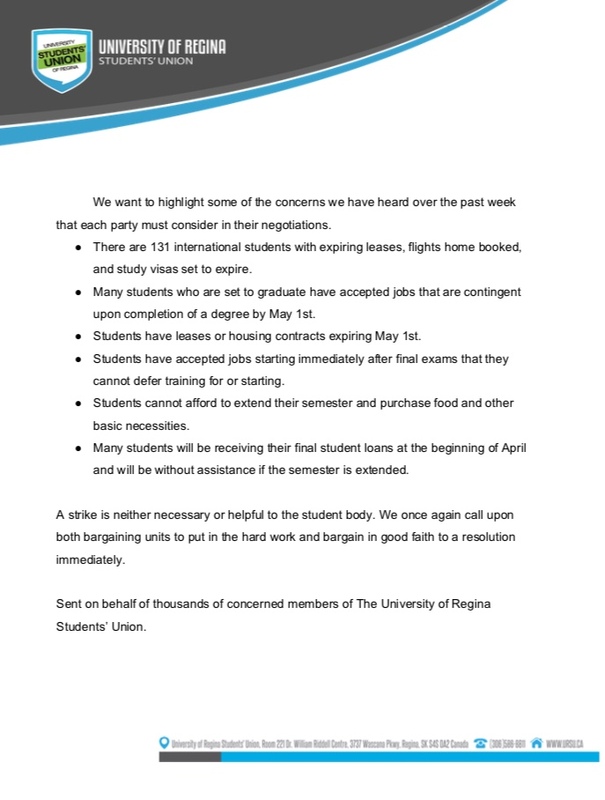 Sent on behalf of thousands of concerned members of The University of Regina Students’ Union.